Hey, I'm finally getting started on my Barrelback. I live in Rome, Ga., I've rebuilt cars, motorcycles, a couple boats and helped restore a couple airplanes over the years. 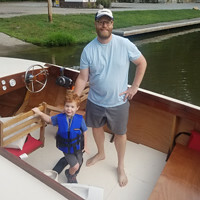 When I was 16 I decided I was going to build a plywood hydroplane for an outboard but quickly discovered that the common plywood I had access to at the time was going to be unusable and the boat untenable. I have been working with wood since I was very young, my Christmas gifts at 11 years old included an electric drill, jigsaw and circular saw. I've built cabinets and furniture and currently I've been turning bowls. In the late '80s, I fell in love with an iconic wooden boat while watching an Indiana Jones movie and decided that one day I wanted to own a Barrelback runabout but soon found out that an original Chris Craft was very much out of my league, financially speaking. A couple years ago I discovered Glen-L Boats and realized that a Barrelback was actually a possibility. As a single father with limited resources I knew it would still be a struggle, mainly because of the expense of an engine and transmission. I had even considered buying an inboard ski boat as a donor and while looking for a suitable boat online last week I found a listing 400 miles from home of two inboard engines with transmissions for sale at a very reasonable price. I made an offer that I didn't expect to be accepted and was surprised by the seller's response. We drove to Foley, AL, near Gulf Shores from north west Georgia and picked up what turned out to be a pair of Chris Craft 283 engines and transmissions as well as an additional Velvet Drive transmission. So, now I am ordering a set of Barrelback 19 plans and hope to get started soon. My plan is to build my boat rather unconventionally and I'll explain that in another post. Building a Barrelback in Rome, Ga.
Never fly with anyone braver than you. Never run out of airspeed, altitude and ideas at the same time. Lots of barrelback builders on the forum. As any question, we are all here to help. Now I'll ask mine. What do you mean by unconventional? So are you putting both engines in the barrel back? By "unconventional" I mean I plan to build mine not from mahogany as is traditional but with white oak that has grown on my property and that I will mill myself. I may use mahogany for the final finish layer but I haven't decided yet. I may use flat- or rift-sawn white oak for the topsides and quarter-sawn for the main deck. No, just one. lol. Who knows? If the Barrelback build goes well the other engine might end up in a Gentry later! Greg Hall we'll be watching. You need to come to the Gathering in September. Not far for you. Lots to see and learn. I do plan to come to the Gathering, we aren't far at all from the Chattanooga area. I do plan to blog the build, I have a Youtube channel (www.youtube.com/c/austringercreations) where I will post videos of my build. White oak is great framing material. Add in the fact that it's from your own property and that's even better. Have fun with your build!